Happy #tacotuesday! Tacos are not the most unhealthy indulgence, but it’s the shell and certain fatty add ins like sour cream that break the meal and your diet. 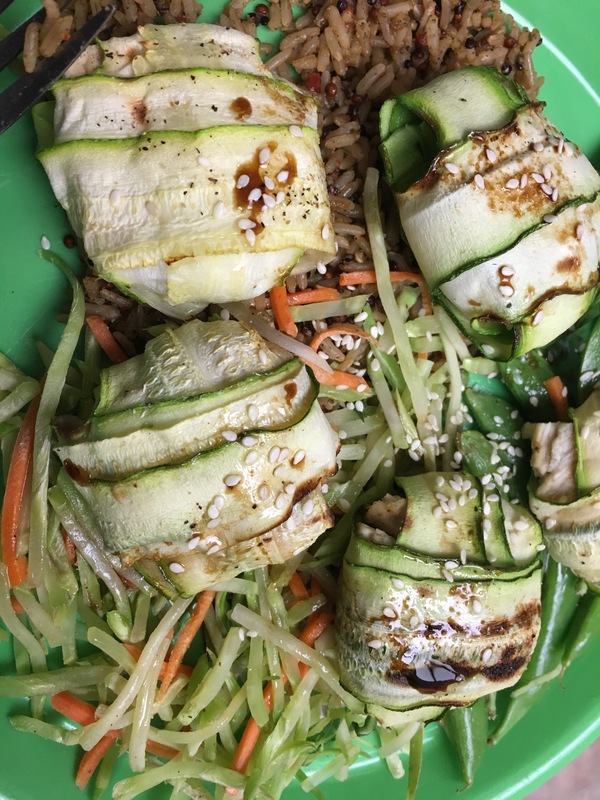 The good news is the dish is welcoming towards different veggies, so load ’em up! Directions: Slice peppers and about a 1/4 of the onion. 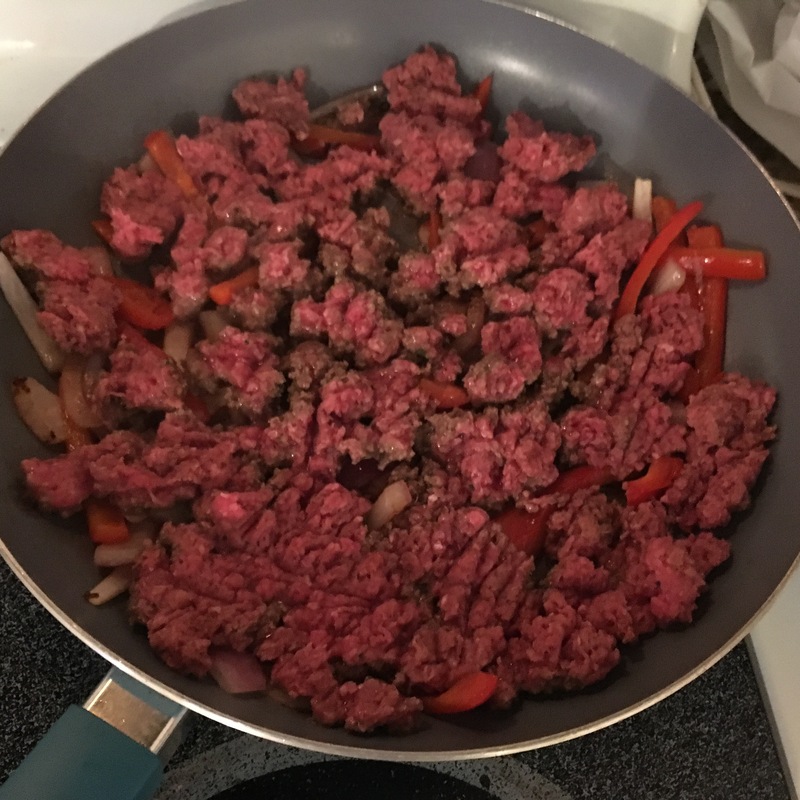 Place meat in a large bowl and season with cumin, garlic powder, various peppers (chipotle, cayenne and black were used here), cilantro, lime juice and salt. 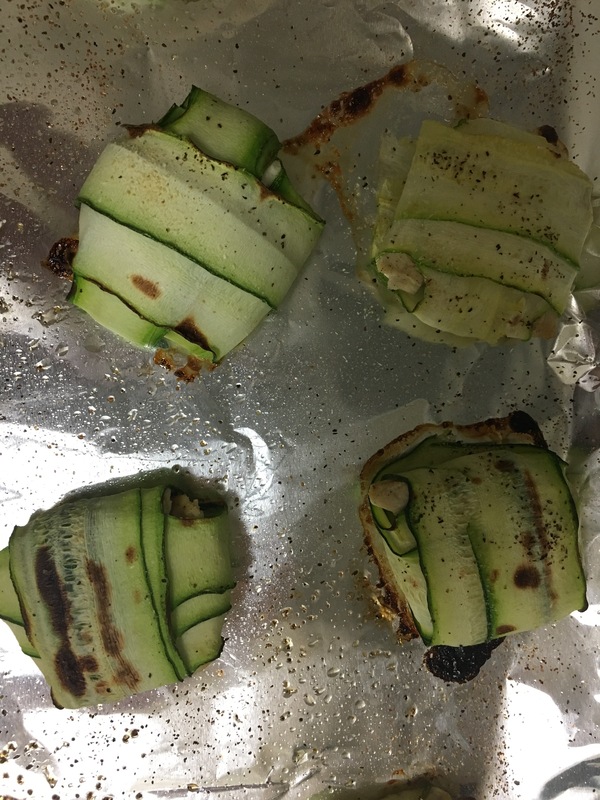 A dash of balsamic vinegar was also thrown in. In a greased pan, sautée peppers and onions until browned. Add meat and dice with spatula. Cook for about 15 mins. 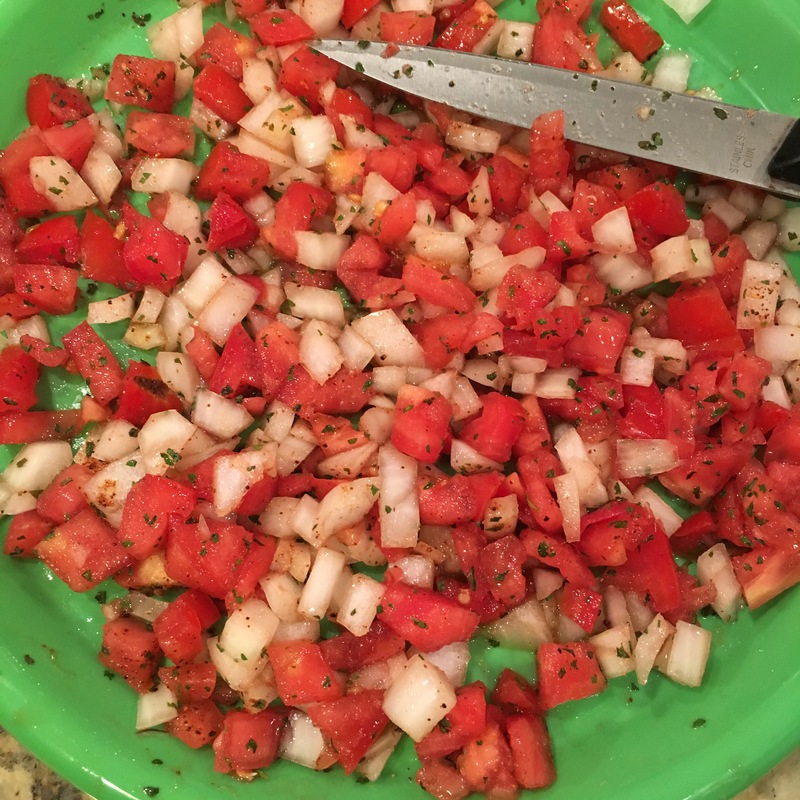 Pick de gallo: Dice about half of the tomato and half of the onion like shown above. Season with cilantro, chipotle and salt. Mix thoroughly. 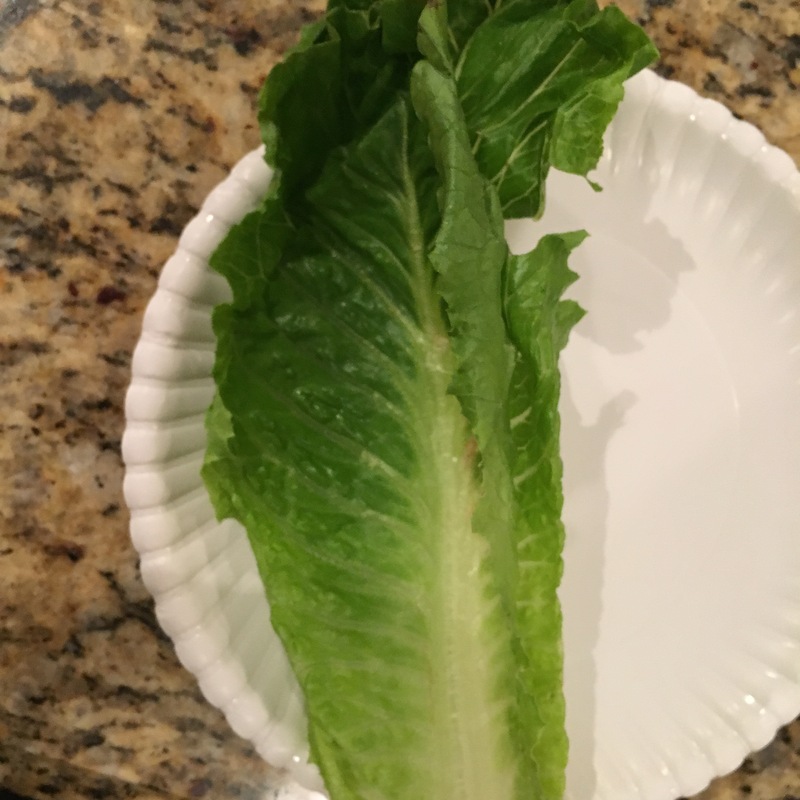 For lettuce wraps, we have found that it’s best to double up the romaine leaves for support. Plus, it adds to your veggie intake. 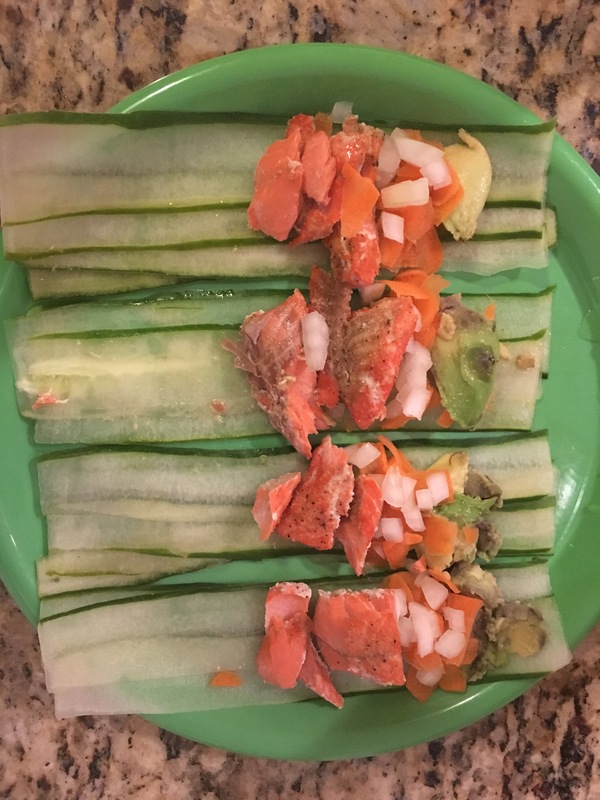 We have layered the wet ingredients first, followed by the meat and some leftover quinoa, a bit of shredded cheese and finally the diced avocado. 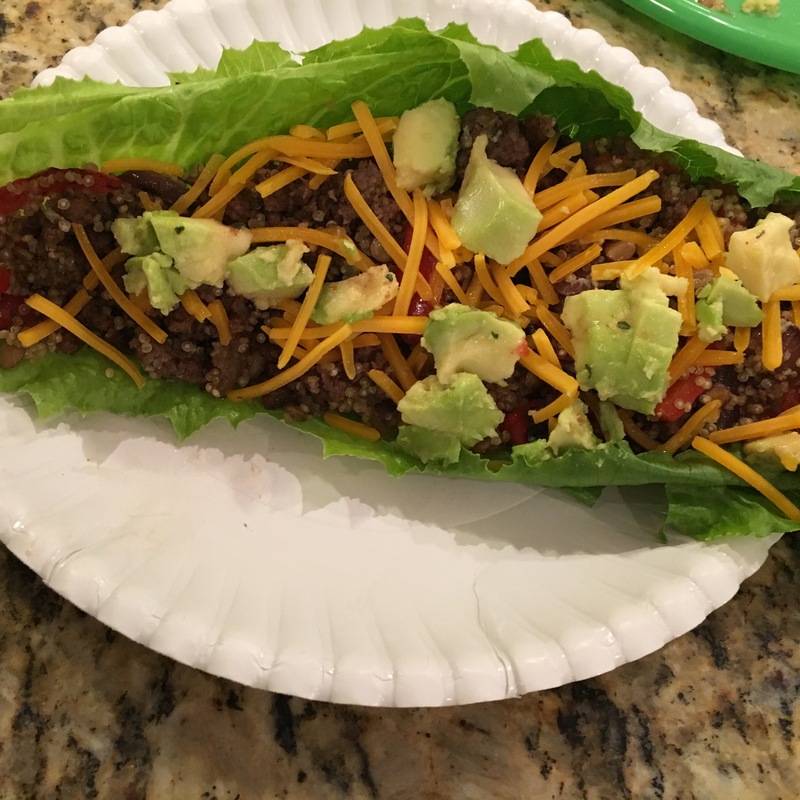 Try to secure an additional romaine leaf on top of the wrap to give it a burrito feel. The final product is hearty and requires two hands. It will make you forget all about Chipotle or Moe’s! Pizza is the end all cheat meal. It’s carbs, dairy, grease, and fat all rolled into a delicious, handheld treat. While many feel like it’s the hardest thing to give up while maintaining a healthy lifestyle, there’s variations that deliver the taste without the trash. 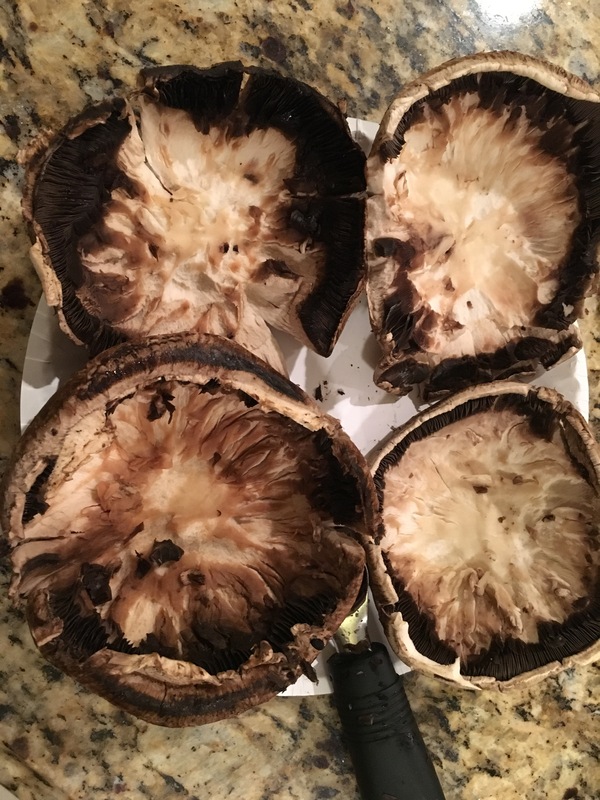 Directions: Scoop out inside of portobello caps (a melon baller was used here), saving the extracted mushroom. Make sure to be CAREFUL while still insuring that a large amount of the inside has been removed. No one wants a holey pizza! 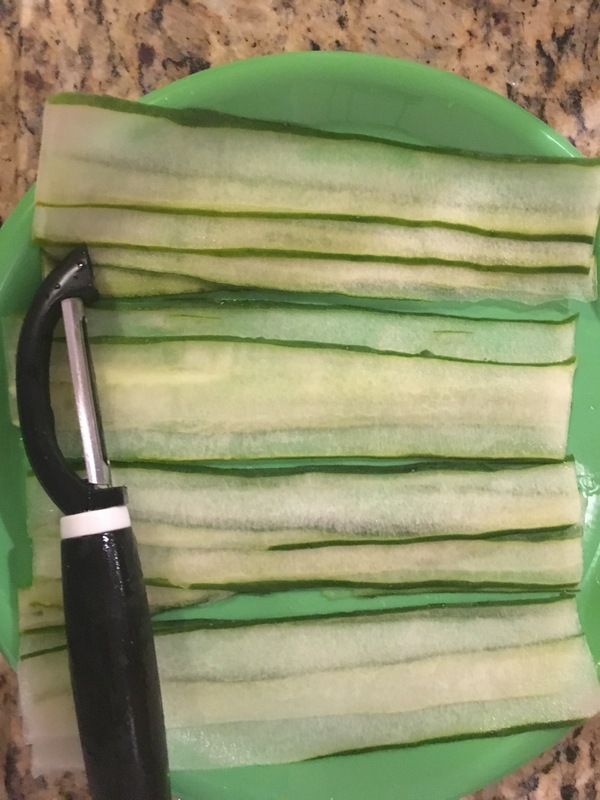 Lightly sprinkle with salt to absorb moisture. Bake on 350 for about 15 mins. Slice peppers and onions. 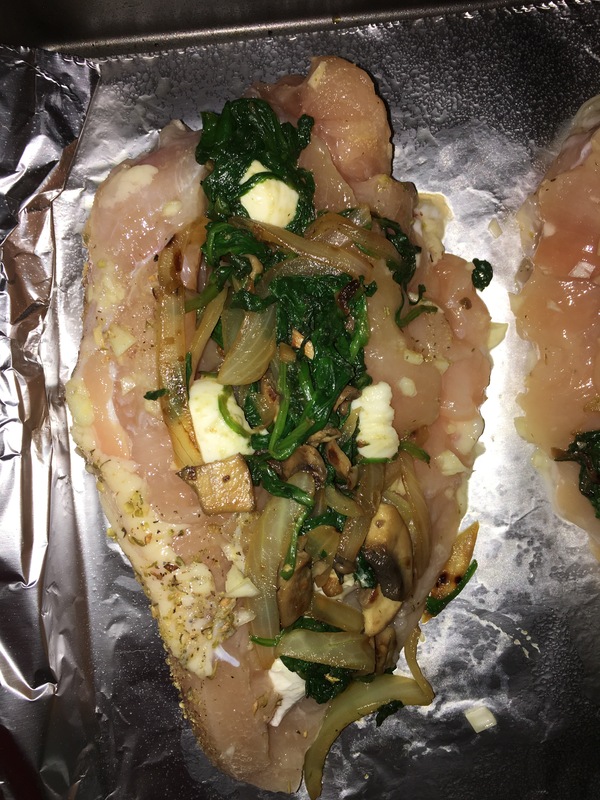 Slice chicken to fit size of portobello cap and lightly season with salt, pepper, and oregano. 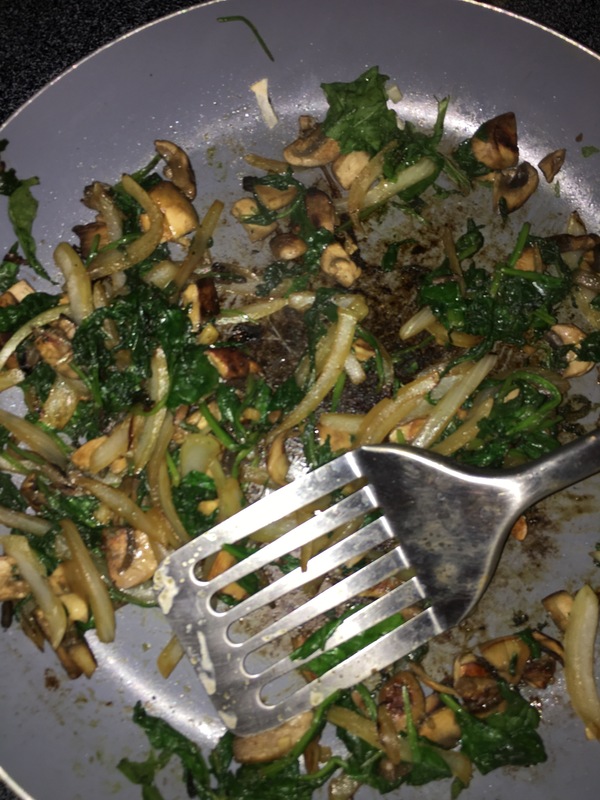 Sauté the removed mushrooms and sliced veggies first. 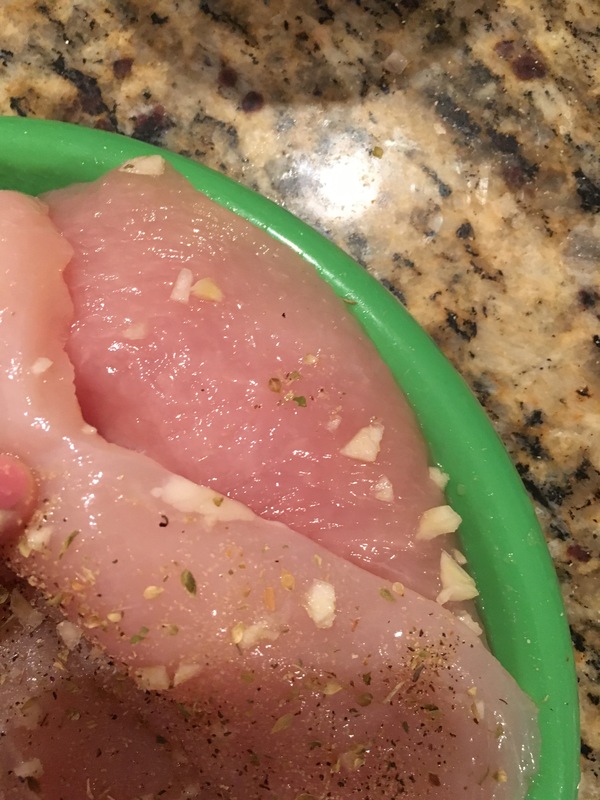 Once browned, add chicken. Cook for about 10-15 mins. 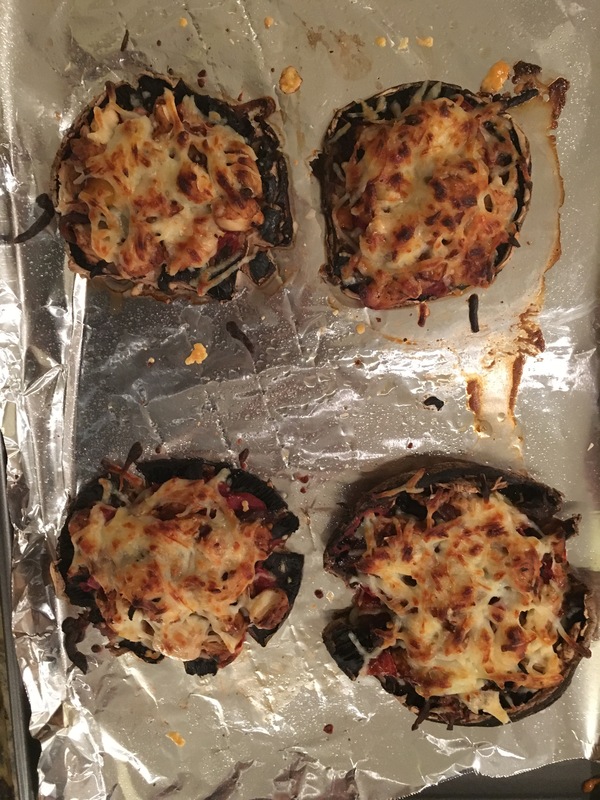 Once portobello caps have cooked, remove from oven and let cool. Once cooled, spread a layer of the tomato paste on for your sauce. 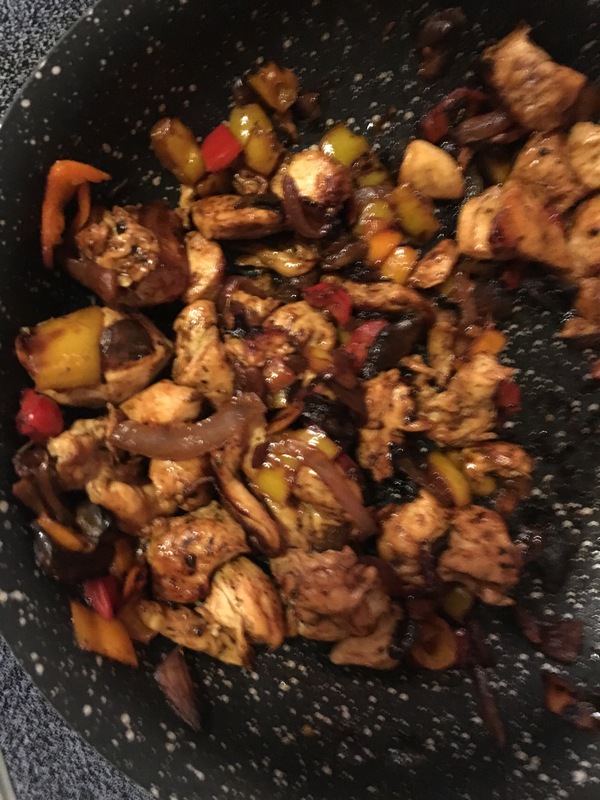 Then add chicken and cooked veggies. Finish with mozzarella. 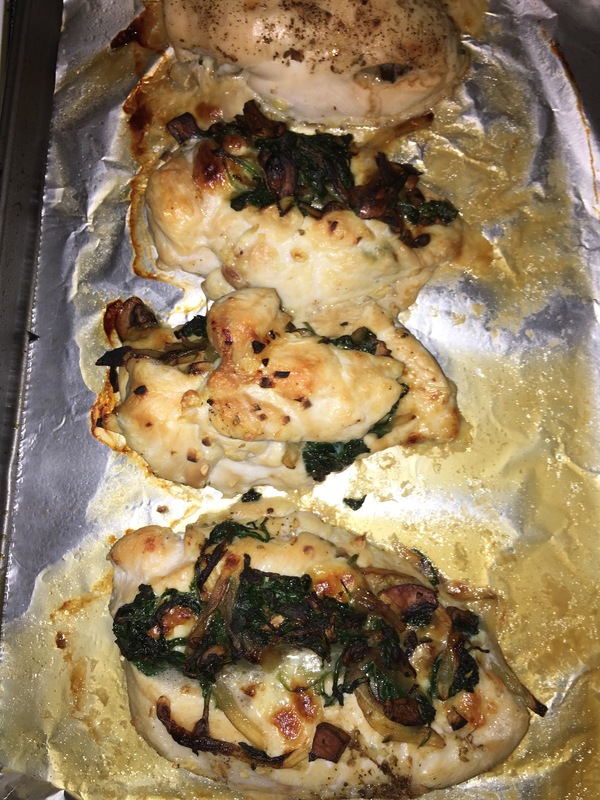 Bake for about 10 mins and broil for 2-5 minutes. Watch carefully! It’s important to remember that all bad food is based off of good, nutritional ingredients (like a bad movie derived from a good book)😜. Don’t think about what you’re giving up, but what you can spin into making healthy! 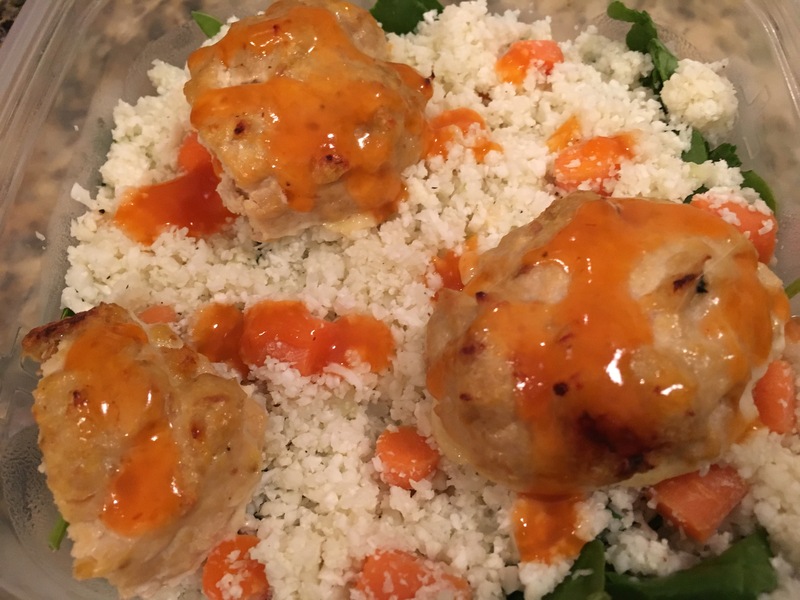 Cauliflower is another vegetable that can be the answer to your carb cravings. 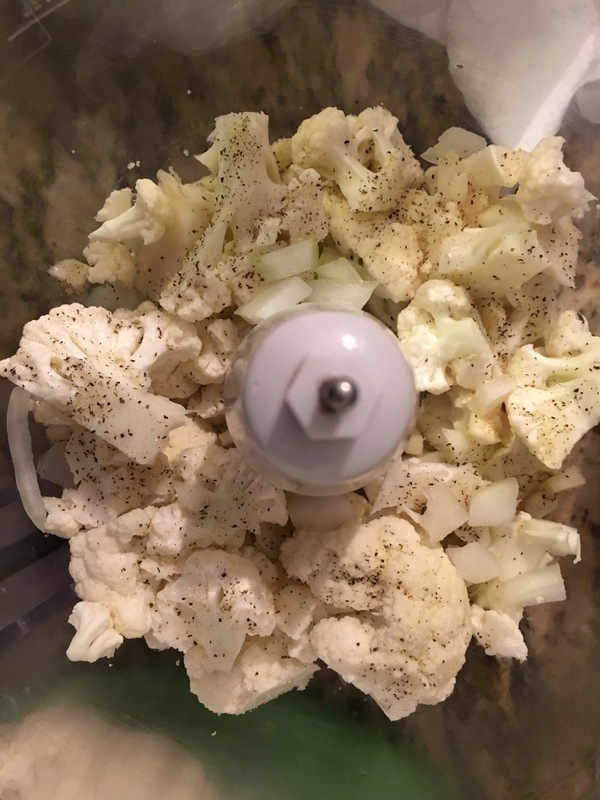 If you can get passed its rather, uh, flatulent odor while it’s being prepared, cauliflower is able to be manipulated into a variety of forms that can serve as a base for any dish. Caulirice: cut the cauliflower head into florets. 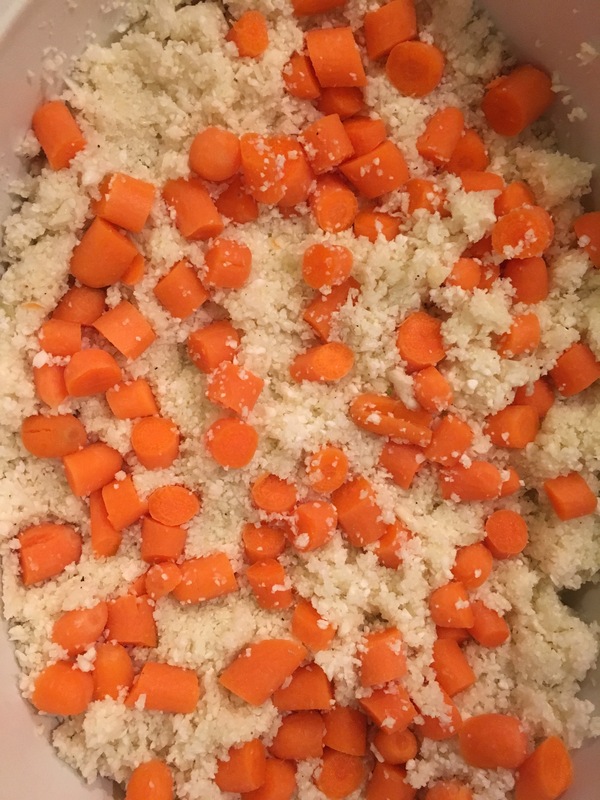 Chop onion, garlic cloves, and carrots and add to cauliflower. 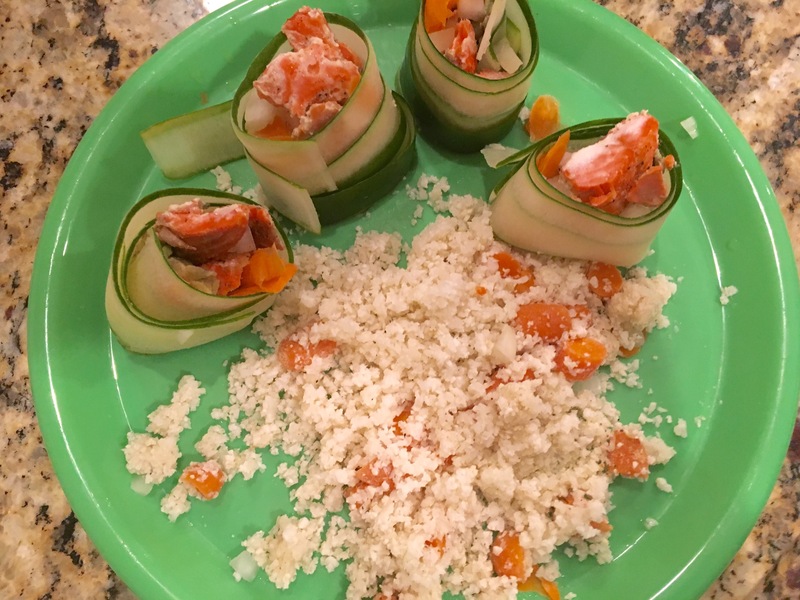 The cauliflower is a bit bland without anything added to it, so the garlic and onion offer great flavor. Season with salt and pepper. A medium size head should be processed in two loads. Do NOT add any liquid. Mashed cauliflower is another conversation for another time 😜. Place in microwave safe dish. Cook for 8-10 mins. 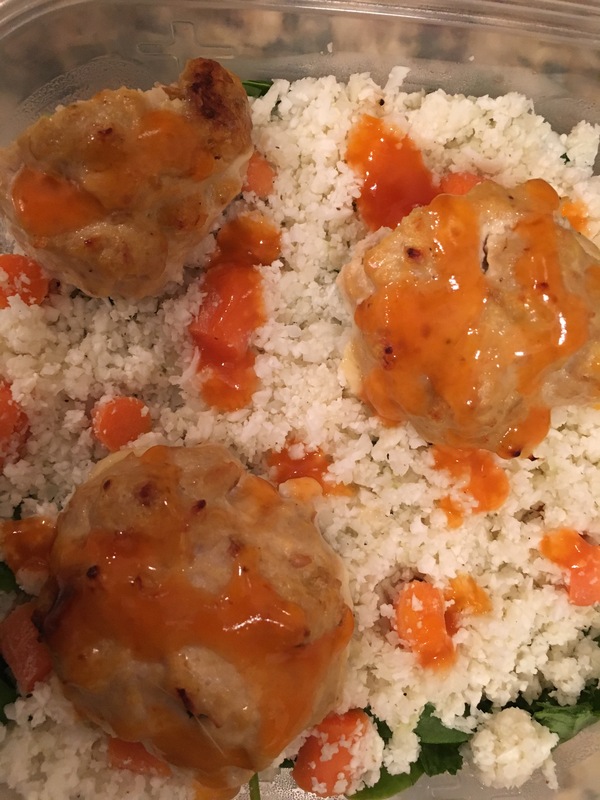 Meatballs: combine all ingredients (using about 3 tablespoons of S&S sauce) in large bowl and mix. 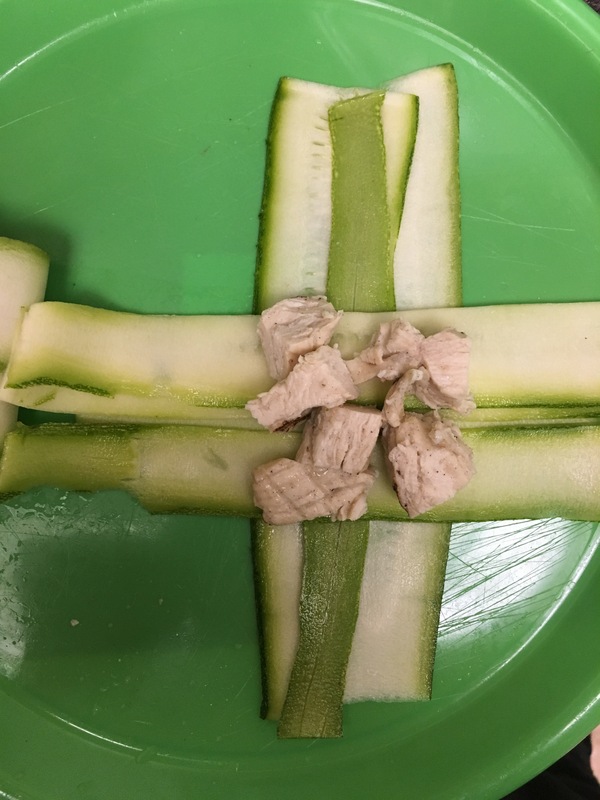 For the breadcrumbs, we used an end piece of Ezekiel bread to keep it safe. Shape into medium size balls. 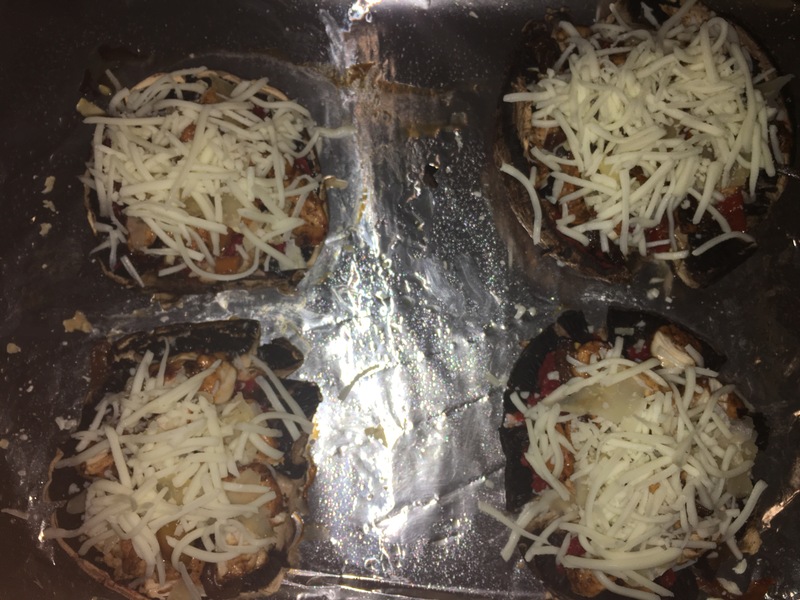 Bake for 30 mins at 350. 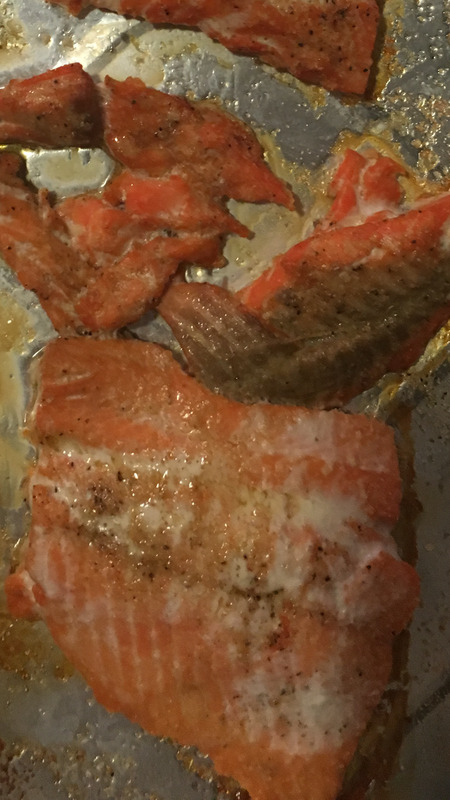 Broil for 2 mins if desired. Serve with extra sauce on the side. 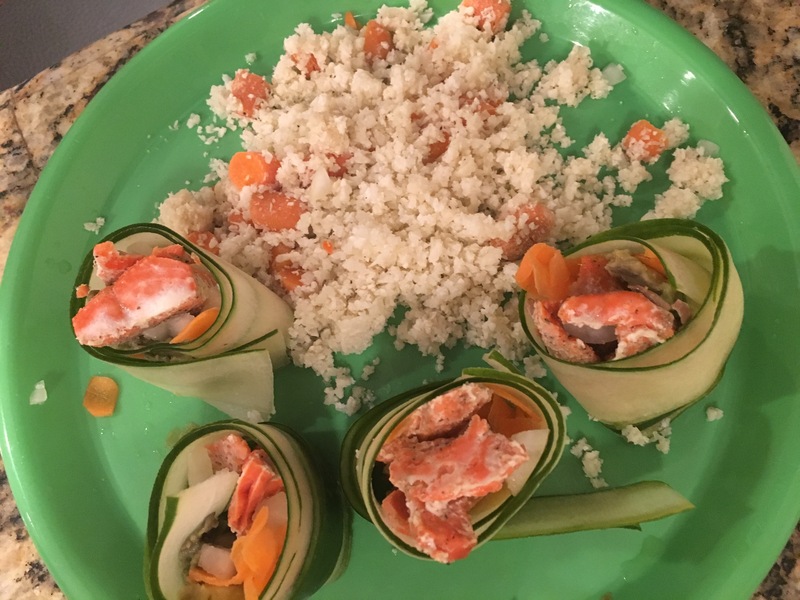 This dish is yet another example of a balanced meal that does not slack in the taste department. One you master it, Caulirice will be your go to fake starch. As I’ve said before, even the most delicious of meals can get boring day in, day out. But, any protein can be spun a different way (#leftoverremix). 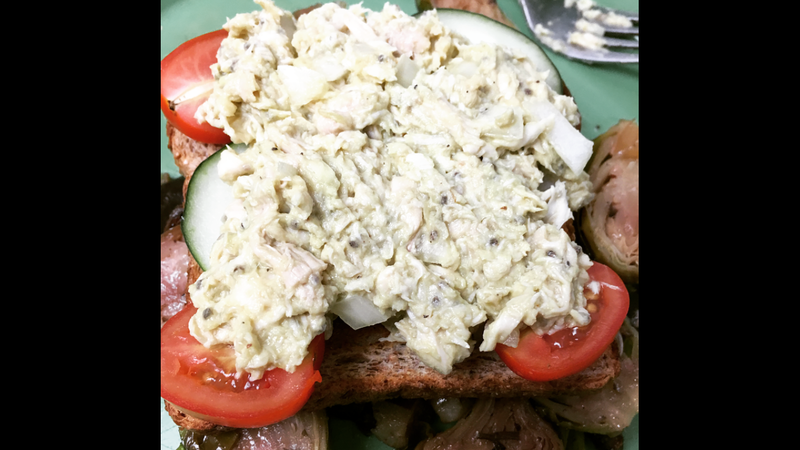 And given the good feedback that was received for the Avocado Egg Salad, as well as the leftover roasted chicken, Avocado Chicken Salad just seemed like the perfect thing to share. First, every last morsole of chicken has been picked from the bones. I have spared the photo of the chicken carcass (very visceral and Game of Thronesy). 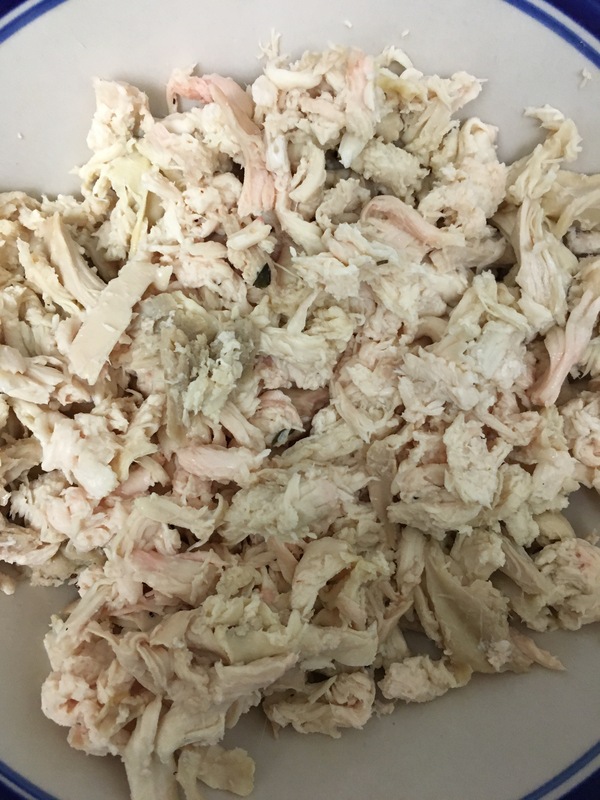 Next, the shredded chicken has been seasoned with lemon juice, salt and pepper. 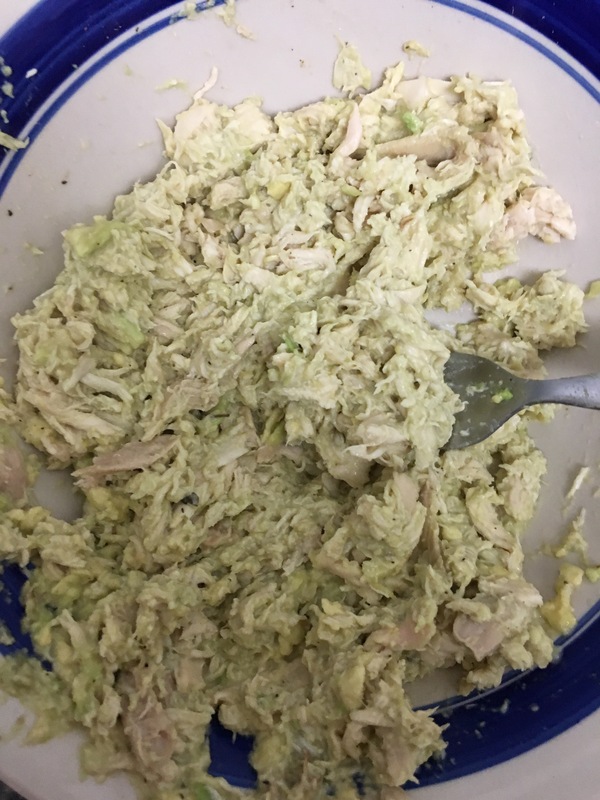 For the cream factor, about 3/4 of a very large haas avocado was used. 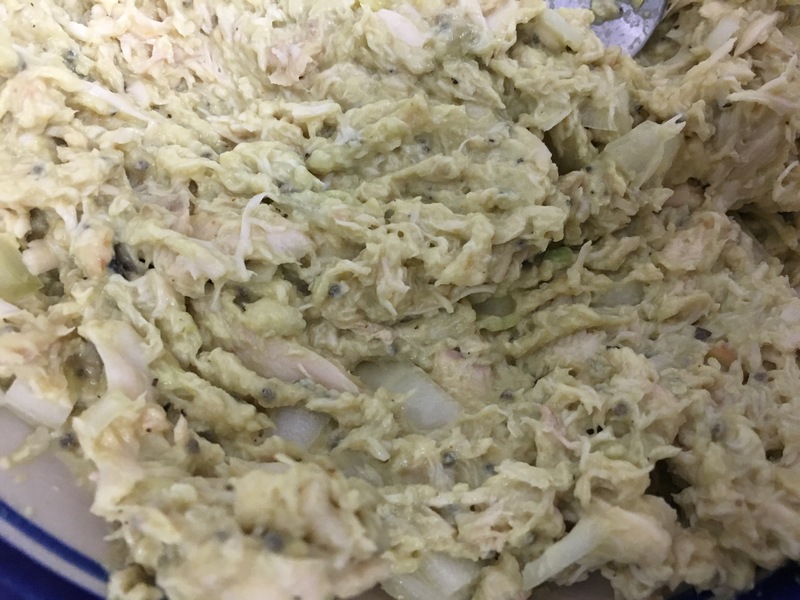 Also, to give it a little bit of a twist, yellow mustard and a pinch of hot sauce has been added, as well as onion and about 2 teaspoons of chia seeds. While chia seeds don’t exactly add any flavor, they do give a bit of extra moisture. When diluted in liquid, the seeds omit a gel (don’t freak out, you won’t even notice it) that is beneficial for your digestive tract. 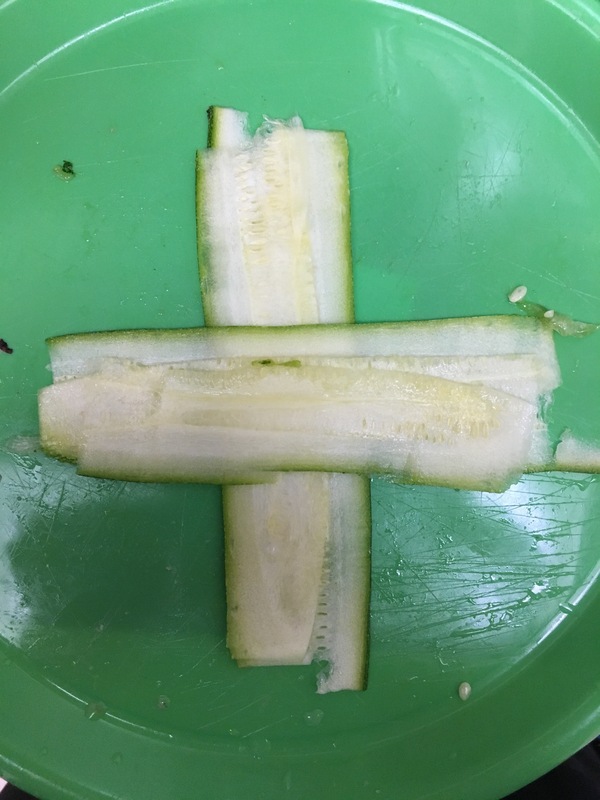 Why not include that in your meal? 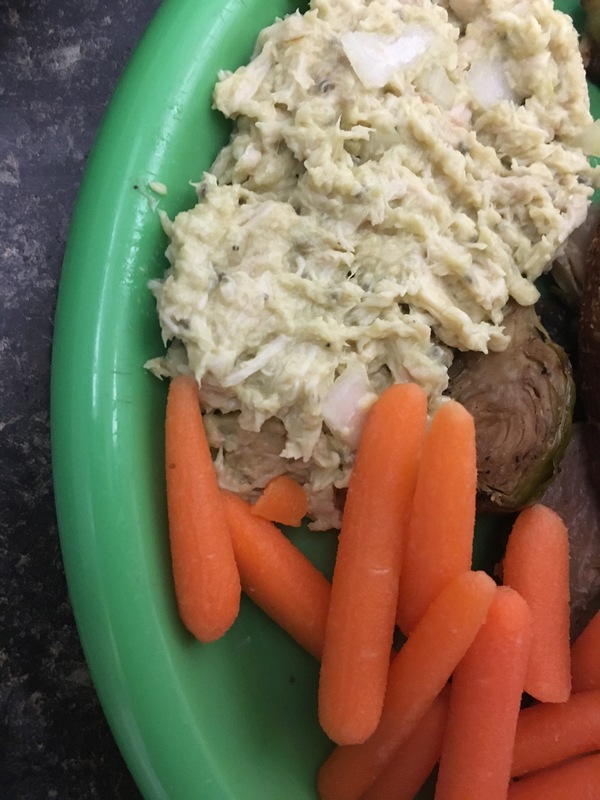 Also, if you’re looking to avoid carbs, the chicken salad can work well as a dip with carrots or zucchini.